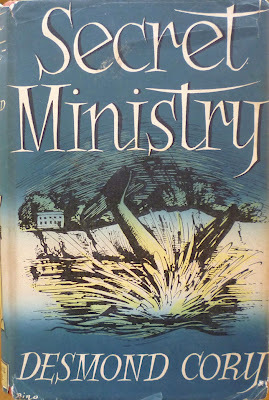 Secret Ministry was first published in hardback in the UK by Frederick Muller in 1951, under a dustjacket designed by the great illustrator, graphic artist and children's author Val Biro. Now, all throughout these Desmond Cory posts I've been banging on about how scarce some of the Johnny Fedora novels are. In one sense, Secret Ministry isn't scarce at all – you can download it as an ebook and read it right now. But in another, more tangible sense, it's nigh on impossible to get hold of. 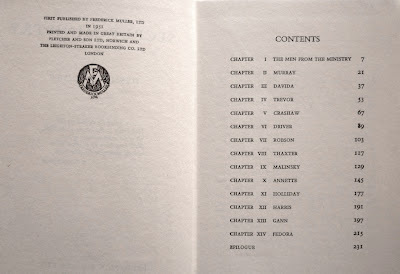 At time of writing there's only one copy of any edition of the book under its original title available online – a Shakespeare Head Conpress Printing (whatever the hell that is) on AbeBooks – although there are also a couple of US Award paperback printings of the novel on AbeBooks under its later title of The Nazi Assassins. 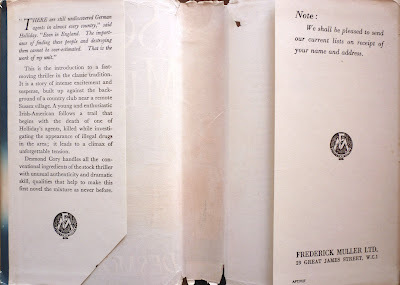 Of the Frederick Muller first edition, however, there is not a single, solitary trace. 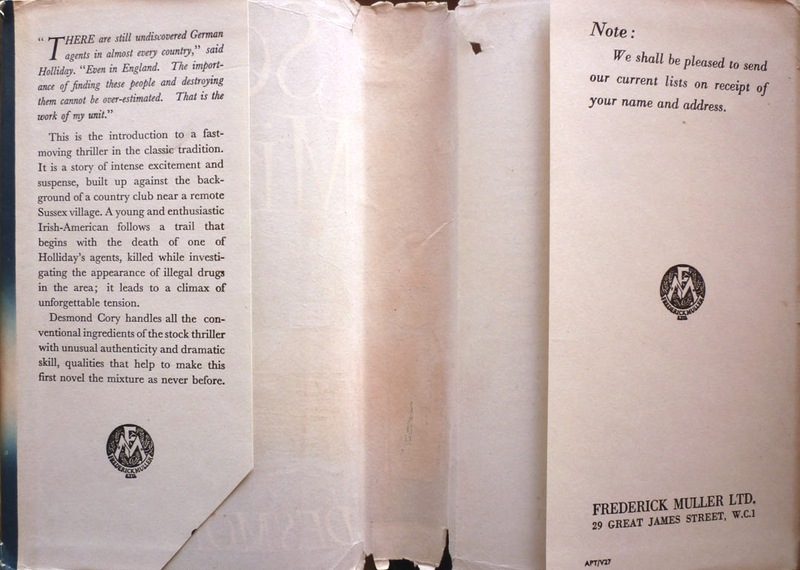 So where did my copy of the Muller first come from? Not from AbeBooks, or Amazon, or eBay, or even an actual, physical, bricks-and-mortar bookshop. No, my copy came from South Africa, via an African eBay-like site called bidorbuy. See, having drawn a blank through the usual channels in my search for a first edition, I resorted to desperately Googling the book's title, and eventually came up with a listing for what looked like it could be the Muller first – the listing included an image of the cover and a date of 1951, but no further publishing info – on bidorbuy (of which I'd never heard before). Unfortunately, the listing had closed. Undeterred, I searched bidorbuy to see if the auction had been won or simply ended, and discovered the latter to be the case. Bidorbuy being an African website I had no idea whether foreign bidders could even participate on it, but I signed up anyway, and contacted the seller to see if they'd consider shipping overseas. Happily they said they would, and after some further communication, between us we managed to arrange shipping to the UK. And I'm glad we did, for a number of reasons. In the first instance, for a collector such as myself, obviously it's quite exciting to own a copy of such an old, rare and important book – not only the debut Johnny Fedora adventure, but one of two novels Cory had published at the outset of his career in 1951 (the other being the first Lindsay Grey murder mystery, Begin, Murderer!) – and in its original dustwrapper, too (which is a little battered, but still bright). Then there's being able to compare and contrast the story to later Fedora outings to see how Cory and his leading man developed, which is certainly instructive. But for me, the book also boasts an added, more personal significance, one I had no inkling of before I read it. I had a brief chat with spy novelist (and friend of Existential Ennui) Jeremy Duns about Secret Ministry on Twitter the other day. Jeremy had just finished the book and noted that it was "light but very enjoyable" and "almost a comic novel, strikingly different tonally from Casino Royale" (Ian Fleming's debut James Bond novel, published two years after Secret Ministry in 1953). And it's true that Secret Ministry is a breezy read – punctuated by bursts of violence, sure, but verging on the madcap in places. But what's especially interesting about it is the way its lightness stands in stark contrast to later novels in the series. 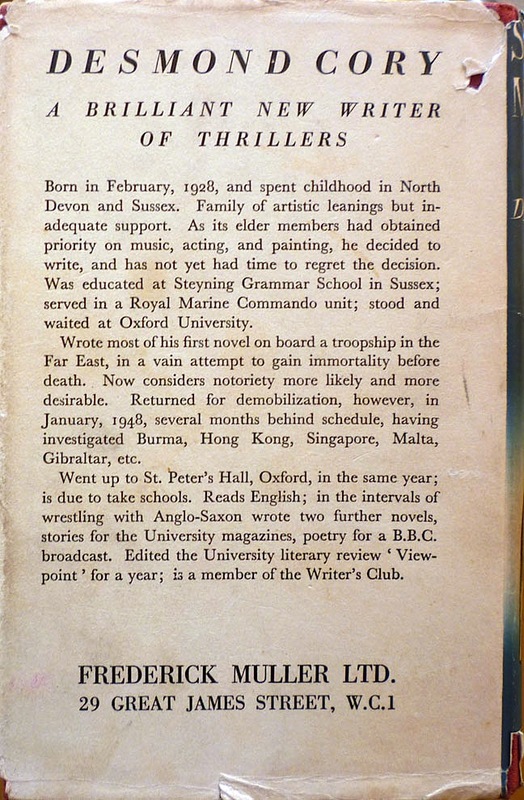 Where, say, Undertow (1962, the twelfth Fedora novel) is characterised by longish, some would say ponderous sequences where seemingly little happens – although, it should be noted, those moments of languor do add colour and psychological depth to the proceedings – Secret Ministry consists largely of hectic dashes and quickfire smart alec dialogue. Moreover, Johnny himself is a very different kind of man than in later books. It's fair to say that Johnny becomes more thoughtful, more introspective as the series progresses (and certainly a lot less gabby: he's quite the chatterbox in Secret Ministry). Here, though, he's a whirlwind of frantic activity, forever darting about, dispensing quips, charming the ladies, charging into action. To some extent a number of those traits are evident in later books, too; Fedora is never the most subtle of operatives, and he retains his roving eye. But in Secret Ministry he displays a young man's nonchalance and lust for life – perhaps reflecting Cory's own youth and joy at embarking on a writing career – with none of the world-weariness which would infect him down the line (not cynicism, though; never cynicism for Johnny). Many of the differences between younger Johnny and older Johnny can, of course, be attributed to both Fedora and Cory growing up. But it isn't just Cory's chief protagonist who becomes more rounded (and, it must be said, more interesting) as the series continues: Cory's writing style changes as well. Self-evidently, Cory became a much better writer as time went on, more willing to let the narrative drift if he felt a few pages of reflection might be necessary, more assured in his handling of character, in digging beneath the surface of his cast. By contrast, there's not much in the way of "down time" in Secret Ministry, and a lot of character – surface character, anyway – is conveyed through dialogue and inflection – copious dropped consonants, colloquialisms, idioms, abbreviations, all rolled out in an attempt at mimicking the way different people actually speak. Which is all very well when it's a straightforward chocks-away airforce pilot (Murray), but slightly more intrusive when it's a young man of Spanish-Irish extraction who's spent some time in America (Fedora). Thankfully it's a habit Cory quickly rids himself of, and by the time of Undertow he can confidently convey nationalities and accents without recourse to verbal tics and idiosyncrasies. All that said, the relative unsophistication of Secret Ministry shouldn't detract from it being a thoroughly likable spy thriller: exciting, agile, action-packed, and wearing its influences lightly but proudly; at one point Johnny directly references "Cheyney and Chandler and Chase" (and also, curiously, Jane Austen). On top of that, we learn Johnny's real name (Sean O'Neill Fedora), and there are hints of the darkness to come, notably in the novel's opening scenes, where Johnny and two fellow agents separately dispatch three Nazis. The remainder of the story may be quite jolly, but right from the off Cory makes no bones about the fact that an encounter with Johnny Fedora will, likely as not, lead to an unpleasant death. Thanks for the download link. I'm just now starting to use my e-reader, and I'm looking for things to put on it. Let me know what you make of the book! This link to the African site looks interesting, although it's a shame they are out of Desmond Cory novels when I searched there. 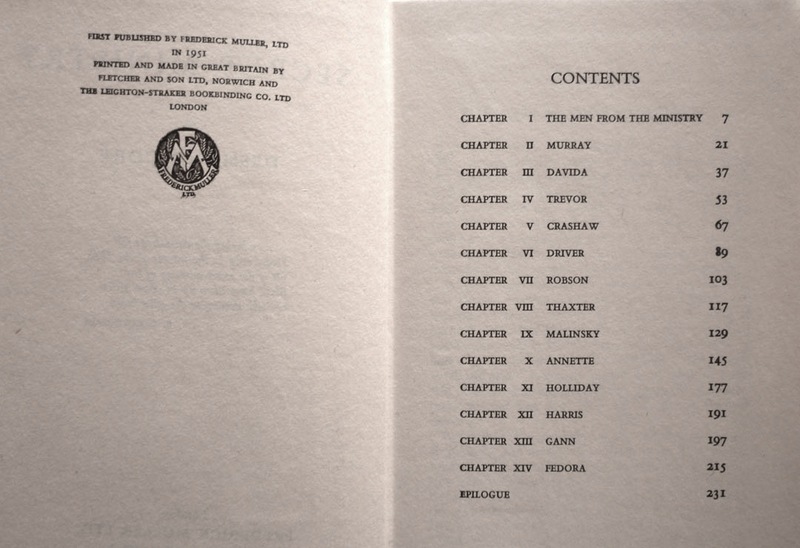 I'm a little envious as a book collector of 1st editions - I have Secret Ministry original but with no dust-jacket. 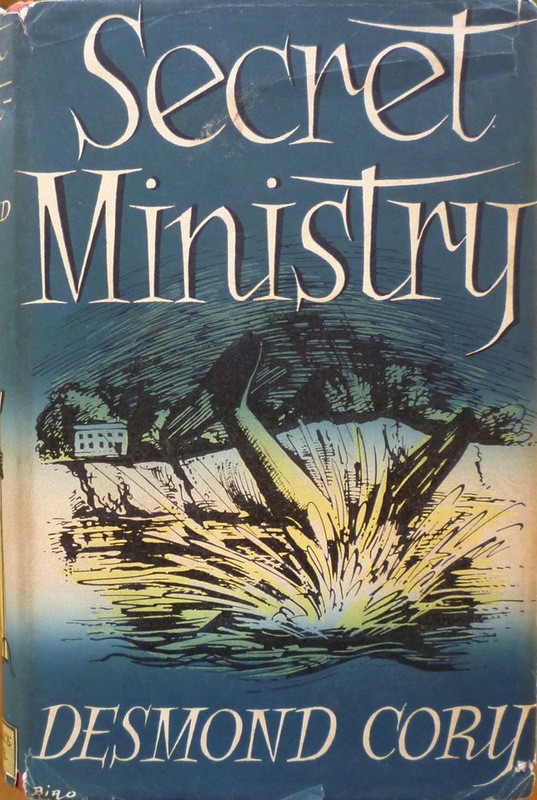 Thomas: that copy of Secret Ministry was the only Cory book on bidorbuy. You never know though: others may appear. A lot of the remaining available first editions of his novels have ended up in either South Africa, Australia or New Zealand; I guess they were either taken out to those countries by expats or exported by distributors. But I was very pleased to find and secure the first of Secret Ministry – as you can probably tell from the post! Nick, I have a copy that looks identical to yours but tehe copyright page states "First published by Shakespeare Head Press (Pty.) Limited in 1951". The Pty Limited suggests an Australian company but it then goes on to say "Printed and made in Great Britain by...". The jacket, which is in very good condition, is unclipped but it doesn't have a price on the front flap. The rear flap has the code APT/V27. I just thought you might be interested to hear about this. Pete. Thanks Pete. I believe Shakespeare Head were the Australian arm of Muller, but books were still printed in Britain, as you say. I have a Shakespeare edition of the later Cory novel Intrigue.